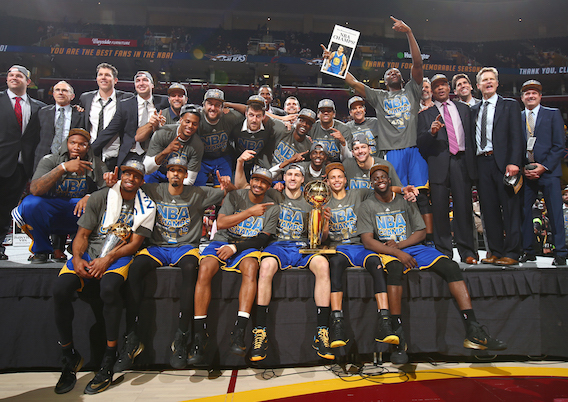 According to the NBA’s General Managers, we’re on for a NBA Finals repeat in 2017. Based on the results of this year’s NBA.com GM survey – predict the Cleveland Cavaliers (96.7%) and Golden State Warriors (96.7%) will meet in a third straight NBA Finals, with the Warriors (69%) tabbed as this year’s title winner. Additionally, Cleveland’s four-time NBA Most Valuable Player LeBron James received 46.7% of the MVP vote. Oklahoma City guard Russell Westbrook (23.3%) finished second in the MVP voting, followed by back-to-back MVP winner Stephen Curry and Houston Rockets guard James Harden (both tied at 10%), then first-year Warriors forward Kevin Durant (6.7%). In terms of offseason activity, the Warriors netted top honours for “best overall offseason moves” (83.3%), “best individual player acquisition” (Durant, 80%) and “most surprising move” (Durant, 46.7%). James was recognised as the NBA’s top small forward (76.8%) for the 11th consecutive year, while Curry (point guard, 63.3%), Harden (shooting guard, 56.7%), Anthony Davis of the New Orleans Pelicans (power forward, 29%) and DeAndre Jordan of the L.A. Clippers (centre, 33.3%) were picked as the best players at their respective positions. Additionally, San Antonio Spurs forward Kawhi Leonard was once again identified as the NBA’s top defender (66.7%) while his coach, Gregg Popovich, received 83.3% of the votes for the league’s best coach and 66.7% of votes as the NBA’s best motivator. The Minnesota Timberwolves nabbed a pair of individual honours for its young roster on the way to being listed as the league’s most improved team (56.7%). Last year’s NBA Rookie of the Year Karl-Anthony Towns received 48.3% of the votes for the player General Managers would want to sign and build their roster around, while guard Kris Dunn was a favorite of 46.7% of GMs for 2016-17 Rookie of the Year. Who is the best centre in the NBA?